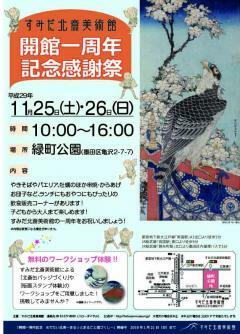 This is a page about Appreciation Festival for 1st anniversary of museum opening for the Sumida Hokusai Museum. We held the Appreciation Festival for 1st anniversary of museum opening in Midoricho park where is located in front of the museum. Workshop booth which museum staff organized and drinking eating space where food and drink are served by food truck will be there. Please feel free to drop in.